TGIF guys. I'm so psyched guys, I'm one week away from my vacation. A couple of you asked what I was going to be doing and the answer to that is simple... nothing! Okay, I shouldn't say that. I'll be doing a little makeover to my nail corner and redecorating as much as I can. I'm a woman on a budget after-all, haha. Being on a budget also made it difficult to purchase entire collections, which is why I was excited to see the minis for OPI's Hawaii Collection. The mini set includes four of the cremes from the collection and retails around $11.99. I purchased mine at Sally's Beauty Salon, but they are also available at Ulta. 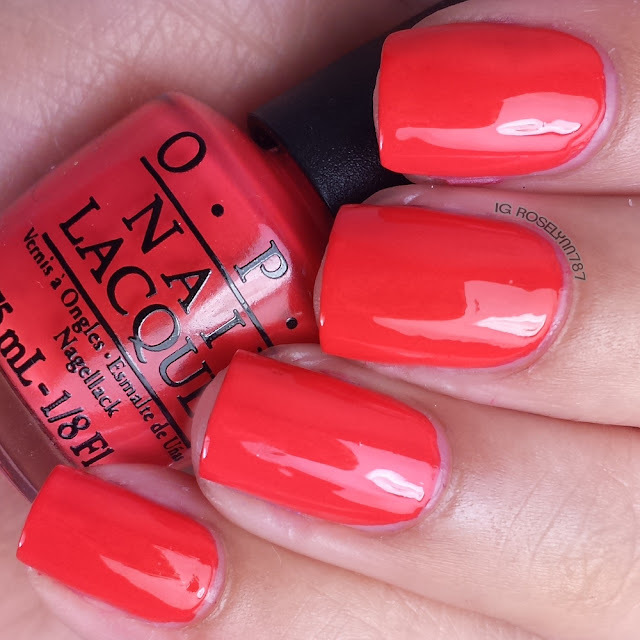 Aloha From OPI is a stunning bright coral-like red. Quite possibly the only true unique shade in the entire collection. I'm head over heels in love with how this shade looks against my skin-tone. My pick for must-have, though I have to say it leans more towards summer than spring. Regardless, I plan on picking up a full-size bottle as well. Great formula and consistency, almost a one coater. For these swatches, I did two thin coats and sealed with a fast drying topcoat. That's Hula-rious is a light mint green creme. So gorgeous and lush, it's the eye-catcher of the bunch without a doubt. The formula and consistency leave a little to be desired. The brush for my mini bottle was extremely wonky, so I don't know if perhaps my bottle brush made this experience worse or not. That said, the formula was a little streaky and uneven on the first coat. I managed to get it down smooth on the second coat and sealed it off with a glossy topcoat. Lost My Bikini in Molokini is a bright violet creme. This is one of the most obvious 'dupe' shades in the collection. Personally, I don't have anything that's exactly this shade but plenty that are just a tone off. Hands-down the best formula of the four from the mini set. It's probably a one coater with a thick enough coat. I have a light-hand when I swatch, so I opted for two smooth coats. 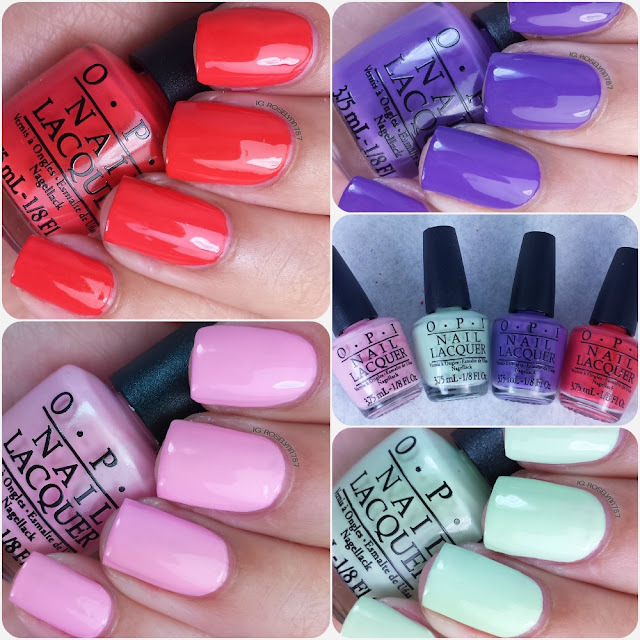 Overall I'm really tore about the OPI Spring Hawaii Collection. Although I think the shades are beautiful, I found myself feeling like I've seen this before, Some of the shades are not unique and I cannot see myself picking up the entire collection. 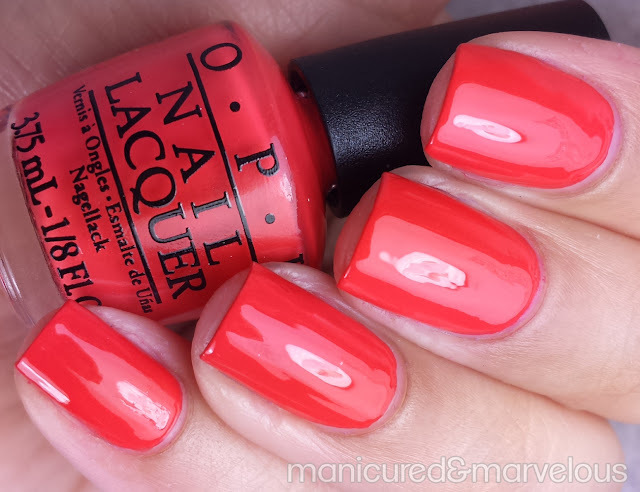 You most certainly can find dupes within and outside of the OPI brand. Two shades that I will be purchasing Hello Hawaii Ya? and Do You Take Lei Away? because the swatches I have seen are gorgeous. Now speaking of this mini set specifically... I was really drawn in by the cremes and the minis give you a good taste of what the Hawaii Collection cooked up. On numerous occasions, I've opted to picking up mini sets for collections, but not once has my experience with the bottles been this terrible. I don't know if it was luck of the draw, but the brushes in two of the four were downright unusable. Very disappointing and definitely makes me question whether or not to opt for minis anymore. So tell me guys, how do you feel about this collection? Have you picked up any? This is an awesome collection of colors. I really like that purple one. My daughter loves to paint her nails whenever she can.. She would be all into these colors. Oh, gorgeous colors! I'm going to have to pick up a bottle of the "Lost My Bikini in Molokini," so pretty. Their mini collections are always aweful in my opinion. Brushes are terrible, hard to handle and too stiff and tiny. The bottles are suuuppper mini and not worth the price, unless you pick them up on clearance at Ulta. These are micro minis! I don't think they help sell full size bottles at all. Those colors are so beautiful and remind me of spring and summer fun. I haven't tried these yet but I'd love to get a few of your colors, minus the purple. It looks great on you but I'm not sure it would on me. Have fun on your vacation. Omg that 'Hula-rious' colour though. It's gorgeous! I like all the shades on you, but I'm with ya - I don't think I'll be picking up the entire line. EEEE these colors are so cute! I love the purple and mint especially! I am a nail polish addict, these colors are amazing! LOVE OPI polish! It's the only kind I buy these days. I love that Aloha color on you!! These are all so pretty - I have a few on their way to me now and I can't wait to try them! I might grab that pink and green! I'm craving the pink and mint so bad! Oh that mint, that's hula one is amazing. My absolute favorite. Very very nice. Wow, nice nail colors! You nailed it. That spring collection of colors looks really great. Girls will love it for sure! That violet shade really rocks. I would try that one in a heart beat. The mint green looks cream to me but maybe because my screen is bright. I can see that being a cute color for summer. I love this whole collection! ( with the exception of the pukey pineapple one :-P ) Beautiful swatches! Love all of those colors but y favorite is green! You have beautiful nails! These are all gorgeous colors! Two of each please!!!! The mint color is my favorite. I go through bottles of mint polish so fast! Those are all gorgeous shades. My favorite is the purple, but the pink looks really pretty as well. Very lovely shades. They look so smooth and vibrant. Thank you for sharing. What beautiful colors! I would definitely say they remind me of Hawaiian colors. I love all of those colors! I'd especially like to get a nice mint green for spring. I like how shiny the nail polish is... the purple I think is my favorite. I like all of them though. LOVE the Aloha! Coral is the color I get on my toes every time I get a pedicure. Really beautiful swatches! I dunno, I wonder how much the small brush affected the application because I didn't find it to be too terrible (not the best for sure, but not terrible). That is why I just can't bring myself to buy minis too often, I really don't like using them. Aloha is my favorite too, and Molokini! I know that many people love OPI nail polishes, but I haven't had much luck with this brand. However, my oldest sister is one many people that swears by this brand. I love, love that mint green, though. This looks like a great collection of creme polishes. I really like that mint one. I have not used this collection before, but you have fantastic nail skills. These colors are so vibrant. I like every one of them. This is awesome. I love this color palette and OPI always has the greatest colors. Those are really nice colors! You also have a well-manicured nails. I am jealous! Wow these colors are so beautiful, I would love to get a new manicure. I have not worn polish in quite sometime.